Christmas is a holiday built on love, compassion, and giving; a tradition passed down through family and friends. These feelings are matched in the songs, customs, and – not surprisingly – the décor of this season. Of course, you already know what you wish your Christmas would feel like, so we put a list together of modern décor ideas for your holiday season to help inspire you. Follow along and put together some holiday arrangements to really reflect what you want this year. The modern aesthetic is all about careful placement and minimalism. An elegant and graceful living room shouldn’t be overcrowded with Christmas decorations that choke the space. 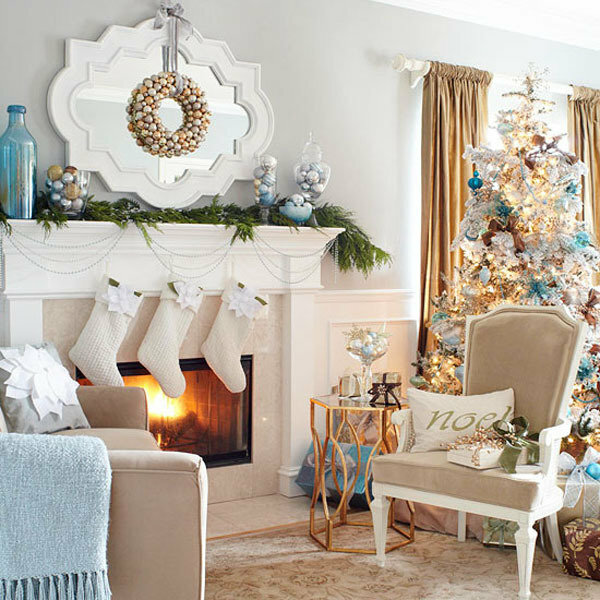 Try sticking to the Christmas tree, a natural mantel decoration, and maybe some decorative trees here and there to create carefully articulated interior design. The crackling fireplace will warm up the atmosphere and you’ll feel a lot more relaxed in an uncluttered, welcoming space. You will find that this sort of décor can inspire you to focus on family instead of being bombarded with bright lights and all the Christmas knick knacks you’ve gathered over the years. Declutter your home by keeping totems of what you loved as you grew up; making them family heirlooms. Sometimes homeowners can get caught up solely on colour themes when decorating. It makes sense because décor is extremely visual, but we suggest trying to go deeper this year by exploring textures and prints as well. Mix and match prints into your holiday décor to create some engaging pieces. Working with different textures really adds a hands-on feel to the look of your space! Your living room can become an invitation to reading and writing, to opening paper-wrapped gifts, and cuddling with teddy bears by the fire. Using these sorts of materials really makes you want to interact with them, which makes you even more excited for the upcoming holidays! Tall living rooms can make for a fabulous holiday atmosphere! Imagine a tall pine tree reaching alongside vertical windows, creating an absolutely glamorous feel with presents gathered at its base. Using this as the big visual draw, you can indulge in creating your own dream décor to compliment, keeping in mind that simplicity is key for a modern look. By adding in some sparkles to work with the natural light from the windows will create a picture-perfect background for holiday photos. With a few quick tips and tricks you can safely boost the presence of your fireplace this holiday season! We all know that a crackling fireplace is the perfect spot to settle around during the cold winter evenings so it only makes sense to give it a little more pomp and circumstance. Adding feathers and a wreath decorated with lights gives the whole room a wild, fairy-tale like vibe that will leave you staring for hours. Be sure to choose the things you love and make sure they enhance the beauty of the space without cluttering it. With a few thought out decorations you’ll find that you can reflect the magical essence of this holiday season in your space. We hope this list helps to inspire your own modern and magical holiday settings! Be sure to keep up with Mosaik Homes’ blogs for more helpful tips and tricks.